Congratulations to Anna Slyschak and Elisabeth Schwille on delivering their Ice Breaker speeches last night. We learnt that Anna is originally from the north of Kazakhstan, she moved to Germany at a young age and loves to travel and learn new cultures & languages. She is musically talented having played in a band for many years and is now working in the field of Psychology. Elisabeth is from Baden-Württemberg – the Scottish part of Germany. She loves watching air-crash investigations where she has learnt that airplanes can actually withstand a great deal of stress, which has helped her get over her little fear of flying. She is currently doing a PhD in Psychology and enjoys studying why we do what we do when shopping! 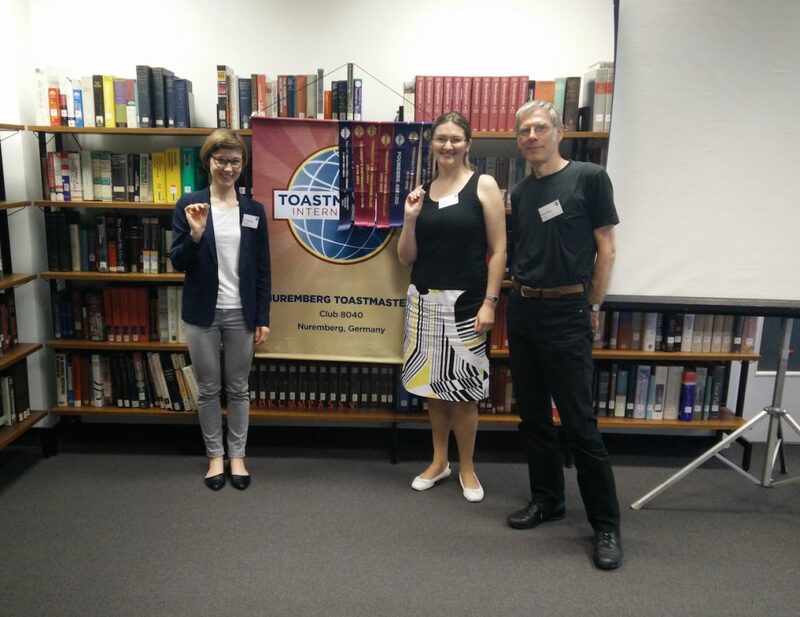 At the end of the meeting they were awarded their Toastmaster badges by Club President – Karsten Brach (CC). Pictured Below (l-r) Elisabeth Schwille, Anna Slyschak and Club President – Karsten Brach (CC). This entry was posted in Club Meetings and tagged Ice Breaker Speech, Nuremberg Public Speaking Club, Presentation Skills, public speaking, toastmasters. Bookmark the permalink.